Who’d have thought that bodyboarding in the chilly water of the North Sea would be good for easing muscles aching from three consecutive days of intense exercise? My body felt revived and invigorated as I squelched out of the waves onto the wet sand of Bamburgh Beach to join the rest of the participants experiencing a residential boot camp in Northumberland with Northern Bootcamp. Disclosure: Stuart Forster, the author of this post, was invited to a four-day bootcamp as a guest of Northern Bootcamp and retained full editorial control of this post. Northern Bootcamp did not review or approve this article. By the time I moved away from the waterline a couple of the group were already huddling in the minibus that would drive us back to Northern Bootcamp’s headquarters — a converted farmhouse near Belford. We hadn’t met prior to the induction on Friday evening but it hadn’t taken long for us to bond as a team. Aged from their twenties into their sixties, there were a couple more women than men participating in the boot camp that I attended. Several of the attendees had the goal of losing weight. Others wanted to get on with a stint of exercise unhindered by the distractions of friends or family. One woman was present because she’d just split with her boyfriend and simply wanted a change of scenery. Our motivations were mixed but we had in common the perceived need of a change. Northern Bootcamp’s residential boot camps are designed to promote weight loss and fitness. They are frequently a catalyst to people kickstarting improved regimes of exercise and nutrition. The timing of the four-day camp I attended proved ideal. Over the preceding weeks I’d eaten well, drank plenty and got out of the habit of my regular swimming sessions. Following a medical operation, I’d piled on the weight, felt fatter than normal and needed a jolt to get me back into good habits. I think it’s beneficial that the camp takes participants out of their regular environment. Away from the distractions of everyday life people are unhindered in giving everything during the sessions. Dan Smith after dropping Northern Bootcamp participants for an endurance walk in Northumberland. A typical day at Northern Bootcamp is tough but rewarding. The day’s activities start at around 7.30am and continue until shortly before dinner at 6pm. The morning sessions tend to be toughest. Weight-based exercises, hill sprints (even at my plodding pace it was still classified as sprinting) and gym sessions feature before lunch. So too did circuits, boxing training and running on Bamburgh Beach. Afternoon activities tend to be more team-orientated, with an emphasis on having fun. On the first full day we were divided into two teams and spent the afternoon picking up ersatz body parts, carrying them around on a stretcher and, after adding each new part, undertaking exercises such as burpees and skaters. We then played a game of catch ball, which brought out people’s competitive spirits. Bodyboarding, stand up paddle boarding, coasteering and kayaking also count among the activities that participants can undertake at Northern Bootcamp. Inevitably, the weather plays a role in what people can do. If the North Sea is stormy then it’s simply unsafe to go out into the water. The third day saw us undertake an endurance exercise, an 18-mile hike across the Cheviot Hills, taking in a section of St Cuthbert’s Way, the long-distance footpath that runs 62.5 miles between Melrose and Lindisfarne. The majority of the pictures illustrating this post were photographed during the endurance walk. Why? It probably wouldn’t have been fair for me to post images of other participants sweating and grimacing during exercises. Additionally, I was so involved in the exercises that I was unable to photograph…have you ever tried using a camera while wearing boxing gloves? St Cuthbert’s Cave on St Cuthbert’s Way, a long distance footpath in the countryside of Northumberland. Monks carrying the remains of the saint are said to have sheltered here while fleeing Vikings. A handful of motivational messages hang on the walls of the Northern Bootcamp headquarters. Books on healthy eating and aspects of fitness are available to read in the communal areas. The chalkboard in the dining room displayed different motivational quotes each day of the camp: “Sore Today, Strong Tomorrow,” is one that resonated with me. Waking during the second night at the camp I was thirsty and decided to get out of bed for a glass of water. Yet when I tried to move I felt like a tortoise that had been flipped onto its back. I flailed around for what felt like an age before eventually struggling up and slowly walking across the bedroom with like I was wearing some invisible suit of heavy armour. The pain in my thighs, calves and buttocks was a result of working hard. Rather than regretting the pain that I’d inflicted upon myself, my aching muscles made me question why I hadn’t been undertaking intensive sporting activity on a more frequent basis. Signpost on St Cuthbert’s Way on the Cheviot Hills in Northumberland. The food served at Northern Bootcamp is healthy, light on carbohydrates and very tasty. It proves that you don’t need to forsake flavour when you eat sensibly. On arriving I was given the option of fitness or weight loss portions. During a dinnertime discussion the group came to a consensus that most of us had got into the bad habit of eating significantly more than we really needed prior to coming to the boot camp. Impressed by the flavour and nutritional balance of the food served at Northern Bootcamp, I bought the Bootcamp Kitchen recipe book and have been cooking dishes from it subsequently. A dish served at Northern Bootcamp. Vegan, Vegetarian and gluten-free cuisine was an option. Northern Bootcamp was founded by Dan and Caroline Smith, a husband and wife team who ran their first boot camp, for friends and family, in Weardale during 2010. Caroline gained experience of working in the outdoors business in New Zealand while Dan spent 13 years as a British Army physical training instructor. The camps run by Northern Bootcamp are non-military, so there’s not shouting to drive participants on. “I think it’s not for everyone…even when I was in the army that wasn’t always a good thing to do. You can encourage people hard without shouting and screaming every five minutes. People want to feel like they’re being cared for. At the same time, we do push people,” explained Dan. Dan and Caroline Smith the founders of Northern Bootcamp. I asked Dan why Northern Bootcamp is now based in Northumberland. “Coasteering involves traversing around the inter-tidal zone of the coastline. Within that you’ll have caves, jumps into the water if you want to explore the marine life or explore the swell and play in waves in a controlled environment. It’s something that the average person, works in a city, will never, ever do,” he added. “Working out does not have to be fixed sessions in the gym or mean loads of kit to exercise. We try to get outdoors. Making it fun is a big part of what we do. We call the adventure hidden exercise. We keep the afternoon sessions active in a fun way, which makes it easier for people to carry on when they leave,” said Dan when I asked him about his approach to fitness. A pillbox, dating from World War Two, that we walked past during the Northern Bootcamp endurance walk in the Cheviot Hills. I was sent a comprehensive kit list ahead of travelling to Northern Bootcamp, so knew what clothing and footwear to bring. Participants also need to bring the right attitude. I found trying exercises and activities that pushed me out of my comfort zone to be fun and rewarding. The team of instructors clearly knew their stuff and I learnt a raft of new exercises that I’ve been performing subsequently. “Come with an open mind and give it your all. Hopefully on the first day we break down all those fears people have and it’s not that hard. The word ‘bootcamp’ can scare people. Hopefully the first few hours here relaxes people and they go for it,” suggested Dan when I asked him for tips on what participants should bring. The team of instructors who lead the sessions at Northern Bootcamp see a spectrum of fitness levels among attendees. “We get people who have not exercised in a long, long time and people who are new to exercise. Some people have exercised all their lives. They get pushed accordingly,” explained Dan. Above all, Dan enjoys seeing the looks on people’s faces when they leave. “Some people come and it’s all new to them. They leave willing to go for it and want to change. Seeing people realise how hard they can push their bodies and their boundaries. Seeing that is amazing,” commented Northern Bootcamp’s co-owner. Northern Bootcamp participants walking on St Cuthbert’s Way, a long distance footpath in the countryside of Northumberland. “I think there’s a stigma attached the boot camps and people think it’s for obese, overweight people…It’s a bit of a myth that it’s just for people who want to lose weight” said Caroline while we chatted in the dining room. “We have a growing percentage of clients who come because they enjoy it. The love exercising from morning to evening. There’s loads of variety, so they’re never bored,” she added. “Lots of people come back and say they do so because they don’t have to think. We give them lovely food, we tell them where to be and what to wear and plan all activities. It’s a very full programme and they go away feeling fantastic,” she said after I’d discovered I’d lost nine pounds and three centimetres off my waistline during a four-day residential camp. 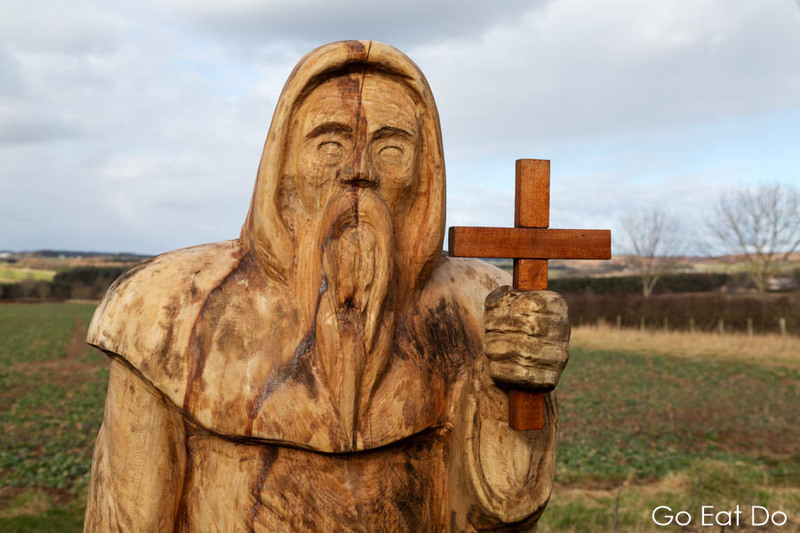 A carved wooden figure depicts St Cuthbert on St Cuthbert’s Way. The cross pretty much marks the spot where we paused to eat a flask of soup. David Whittle was a fellow participant at the camp I attended. “I’ve reached a certain age, 61, and just getting gentle health issues. Over the past three years I’ve put on maybe three stone in weight, slowly, so it’s just crept up on me. I’ve decided to do something about it. Just signing up for the boot camp had an effect. I lost a stone before I came here. It was a chance to take charge of my life and, hopefully, kick-start a new regime,” he said when I asked why he was at Northern Bootcamp. He cites the satisfaction after a good session of activity as being the principal reward of attending Northern Bootcamp. “I did activities I would never do — coasteering. That’s the thing here, you do strength, endurance and speed, so there’s usually something that gives you a bit of a buzz,” said David. 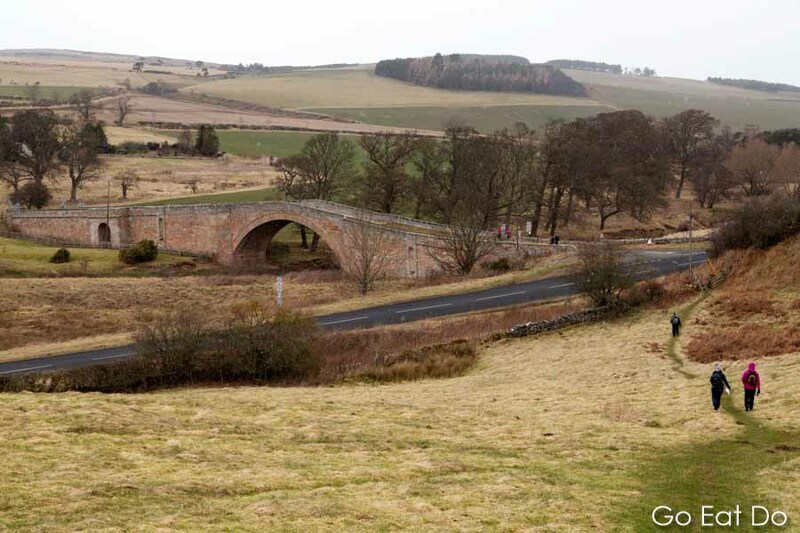 Weetwood Bridge was one of the landmarks we passed during the endurance walk. I thoroughly enjoyed participating in a Northern Bootcamp. The instructors were good, knowledgeable guys to spend time with and helpful in answering my questions about the exercises we were undertaking. The intense, varied exercises were hard work but rewarding. It was a motivational jolt that reminded me how much I enjoy working out and looking after myself by eating healthily. Dan and Caroline Smith saying farewell to me as I left Northern Bootcamp. I travelled to and from Northern Bootcamp by train. Participants have the option of being picked up and dropped at Berwick-upon-Tweed railway station. A fine day for a walk. Snow caps the Cheviot Hills on a winter’s day in Northumberland. Visit the Northern Bootcamp (Golden Hill, Belford, NE70 7JT; tel. 01668 260 076) website to find out more about the company’s boot camps in Northumberland and Portugal. The camps vary in duration from one to 14 days. To find out more about the regions in which the camps are held, take a look at the Visit Northumberland and Visit Algarve websites. Stuart Forster, this post’s author, is an award-winning journalist. He is based in the north-east of England and available for magazine and newspaper commissions. Make contact via this website if you want to sponsor a post on Go Eat Do.